Is there value in backing Borussia Monchengladbach after strong start to the season? Value to be had in Borussia Mönchengladbach for the 18/19 season? Saturday’s win over North Rhine-Westphalia neighbours Schalke 04 secured Borussia Mönchengladbach their best start to a Bundesliga season since 2011/12. And with Die Fohlen having finished 4th by the end of that campaign, we at Free Super Tips got thinking about whether we could see the same happen again this term? Gladbach are now into their third year under coach Dieter Hecking, who was named German Manager of the Year in 2015 after guiding Wolfsburg to a 2nd placed finish in the Bundesliga as well as DFB Pokal and German Super Cup titles, and there are some key signs that point towards them doing just that. So, let’s take a look into why Die Fohlen could be destined for success. Borussia Mönchengladbach’s seven points from three matches is their best start to a season since 2011/12, where they finished 4th. Borussia Mönchengladbach have finished in the top four in three of the last seven seasons (11/12, 14/15 and 15/16). Borussia Mönchengladbach’s two goals conceded is the joint best defensive record in the Bundesliga after three matches. No goalkeeper has saved more shots this season that Gladbach’s Yann Sommer (14). Borussia Mönchengladbach are unbeaten in seven Bundesliga home matches (W5 D2), winning each of the last five. Borussia Mönchengladbach have lost just two of their last 14 Bundesliga home matches (W7 D4 L2), which includes a 2-1 win over Bayern Munich. What makes Borussia Mönchengladbach look better value to finish in the top four now than before the season began isn’t just the points they’ve earned, but rather the distance that they’ve already put between themselves and the other true top four contenders: Gladbach are three points ahead of RB Leipzig, a team that have been struggling to juggle the heavy schedule of both European and domestic football since the start of last season, four points ahead of TSG Hoffenheim, who will be no doubt put more focus towards their maiden participation in the UEFA Champions League group stages over the coming months, and a massive SEVEN points ahead of the point-less Bayer Leverkusen and Schalke, both of which have already dropped points to Dieter Hecking’s side this season. Other teams to have had an uncharacteristically strong start, such as Wolfsburg (5/1), Hertha Berlin (7/1) and Mainz (33/1), aren’t as much of a threat in the long term (keep an eye on Wolfsburg), and as such represent much worse value than Gladbach. Unlike these teams, Borussia Mönchengladbach are a side familier with finishing in the top four, having managed that feat in three of their last seven Bundesliga seasons (11/12, 14/15 and 15/16) – you don’t have to think far back to remember them being in a Champions League group alongside giants like Barcelona, Manchester City and Celtic. Borussia Mönchengladbach are also the latest Bundesliga team to be benefitting from a change in system, having converted to a 4-3-3 from a 4-2-3-1 formation at the start of the season. Players that have previous struggled, like wingers Fabian Johnson (above) and Jonas Hofmann, are now thriving going forward, while coach Hecking is also beginning to iron out the defensive creases that have cost them results in seasons gone by. Keeper Yann Sommer looks better than ever – no keeper has made more saves than him this season so far – and altogether this makes them a dangerous package. Compare Gladbach’s price of 9/2 to other prices in the market (Leipzig at Evens, Leverkusen at 6/4, Schalke at 7/4, Hoffenheim at 3/1) and you can’t help but feel there’s some value there. Now this one is a bit more of a punt, but it’s hard to see a price as big as 25/1 on Borussia Mönchengladbach to finish second – providing Bayern Munich win the league, that is – as that bad of a bet given the circumstances. The five-time Bundesliga winners are just two points behind league leaders Bayern and are equal on points with Borussia Dortmund, both of which have Champions League football kicking off this week. Now there’s obviously a lot of the season to go but the added strain of European competition will likely affect teams like Dortmund, Schalke, Leipzig and Hoffenheim, particularly if they make a deep run in the competition, and in doing so give Gladbach more opportunity to pull ahead. Borussia Mönchengladbach are one of the better sides in the Bundesliga to have no European football to contend with this season, which is a huge positive given their limited squad depth – again, teams like Dortmund, Schalke, Leipzig and Hoffenheim will find it tough in this regard. Admittedly, Die Fohlen haven’t finished as champions or runners up in the Bundesliga since 1978, but compared to some of the other prices going around the “without Bayern Munich” market – Dortmund at 8/11, Leipzig at 6/1, Schalke at 12/1 and Hoffenheim at 16/1 – backing Gladbach does look reasonable. Categories: Blog and Football. Tags: Borussia Park, Bundesliga, Bundesliga Betting Tips, Bundesliga Match Previews, Dieter Hecking, and German Bundesliga. Team Tag: Borussia Monchengladbach. 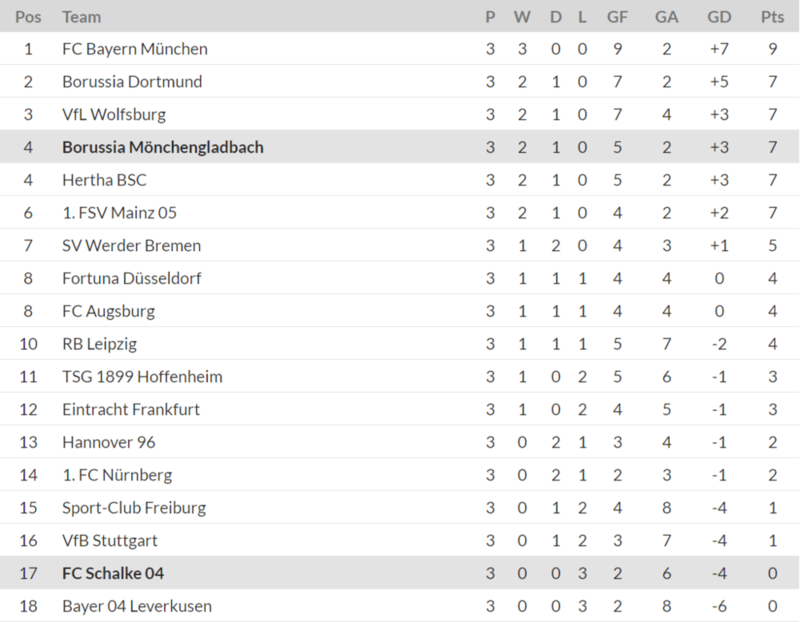 League: German Bundesliga. Sports: Football.